Hajj Abdul Rahman Mohammed Arif Aljumaily (Arabic عبد الرحمن محمد عارف الجميلي`Abd al-Raḥmān `Ārif; April 14, 1916 – August 24, 2007) was President of Iraq, from April 16, 1966, to July 17, 1968. He was a career soldier, and supported the military coup in 1958 that overthrew the monarchy. He also supported the coup that brought his brother, Abdul Salam Arif, to power in 1963. 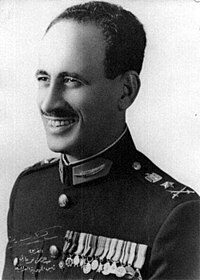 His brother appointed him head of the army following the coup, and when the younger Arif died in an aircraft crash in April 1966, Prime Minister Abdul Rahman al-Bazzaz ("a Western-oriented lawyer" and the first civilian to head an Iraqi government since the 1958 revolution) became acting president; three days later, al-Bazzaz was chosen to become president, then al-Bazzaz immediately relinquished the presidency to Abdul Rahman Arif. It is speculated that the transfer of power possibly occurred because the Iraqi military thought that Abdul Salam should be succeeded by his weak and easier to manipulate brother instead. Arif was appointed president by the Iraqi Revolutionary Command Council. He continued his brother's policies, but with a more nationalistic profile. Like his brother Abdul Salam, he was an overt supporter of Egypt's pan-Arabist president Gamal Abdel Nasser. Arif Abdul Razzak, another pro-Nasser Air Force Commander, attempted a coup d'état on Arif, and lightly bombed the Presidential Palace with Soviet MiG 17 jets, but the coup failed and he was arrested. It was his second failed coup attempt on the Arif government. President Arif went on TV to declare that on this occasion, Abdul Razzak would definitely be punished, only to then release him with a pardon. His presidency was widely believed to be slack and indecisive. However, there are historical clues that he was not corrupt. The ill-advised law that he passed in 1967 to absolve himself from paying income tax is probably an indication that he was not capable of getting wealth otherwise. Shortly after Arif came to power, the Iraqi military launched a major offensive against Kurdish rebels led by Mustafa Barzani in the First Iraqi–Kurdish War, pitting 40,000 Iraqi troops against Barzani's 3,500-strong Peshmerga. Iranian and Israeli support contributed to a decisive Kurdish victory at the Battle of Mount Handren on May 11, where a battle plan devised by IDF military officer Zuri Sagy resulted in the killing of 1,400-2,000 Iraqi troops and the capture of hundreds more. Regime hardliners were discredited by the debacle, and on June 29, Bazzaz announced a Twelve Point Plan for peace, which included "administrative decentralization" in Iraqi Kurdistan and "Kurdish representation in Parliament". Throughout July, Bazzaz began implementing the agreement by "approving a massive rehabilitation program, lifting the economic blockade, releasing hundreds of Kurdish prisoners, removing Arab tribes from former Kurdish lands, and passing a general amnesty law", but opposition within the military forced Arif to dismiss Bazzaz in favor of General Naji Talib on August 6. Regardless, American officials in the Lyndon B. Johnson administration welcomed Iraq's brief return to civilian rule under Bazzaz as well as Arif's thwarting of Razzak's second coup attempt on June 30. Arif was considered "one of the few forces of moderation" in Iraq, having previously established a friendship with U.S. ambassador Robert Strong and making a number of friendly gestures to the United States between April 1966 and January 1967. At Arif's request, President Johnson met five Iraqi generals and Iraqi ambassador Nasir Hani in Washington, D.C. on January 25, 1967, reiterating his "desire to build an ever closer relationship between [the] two governments." According to Johnson's National Security Adviser, Walt Rostow, the U.S. National Security Council even contemplated welcoming Arif on a state visit to Washington, although this proposal was ultimately rejected due to concerns about the stability of Arif's government. Prior to the outbreak of the Six-Day War, Iraqi foreign minister Adnan Pachachi met with a number of U.S. officials to discuss the escalating Middle East crisis on June 1, including U.S. ambassador to the UN Arthur Goldberg, Under Secretary of State for Political Affairs Eugene V. Rostow, Secretary of State Dean Rusk, and President Johnson himself. The political atmosphere engendered by the costly Arab defeat prompted Iraq to break relations with the U.S. on June 7, and ultimately ensured the collapse of Arif's relatively moderate government. On July 17, 1968, while Arif was sleeping, his own assistants along with members of the Ba'ath Party, Ahmed Hassan al-Bakr, overthrew him in a bloodless coup. As Arif and his brother had done in the 1963 coup against Qasim, the coalition declared victory once they had captured the radio station and the ministry of defense. It was accomplished when the defense minister, Hardan Al-Tikriti, phoned Arif informing him that he was no longer president. Arif was exiled to Turkey. He returned to Iraq in 1979, when Saddam Hussein came to power, and largely stayed out of the public and political spotlight afterwards. He was allowed to leave the country once to undertake the Hajj. Arif left Iraq permanently after Hussein was removed from power by the U.S.-led invasion, and lived in Amman, Jordan from 2004. He died in Amman on August 24, 2007, being yet one of the few Iraqi leaders in modern times to die a natural death. He was married to Faika Abdul-Mageed Faris Alanee. "I hope there will be stability and security in all parts of Iraq and neighboring Arab countries", he said. "I hope there will be national unity in Iraq by forgetting the past and looking for the future." ^ Gibson, Bryan R. (2015). Sold Out? US Foreign Policy, Iraq, the Kurds, and the Cold War. Palgrave Macmillan. p. 94. ISBN 978-1-137-48711-7. ^ Gibson, Bryan R. (2015). Sold Out? US Foreign Policy, Iraq, the Kurds, and the Cold War. Palgrave Macmillan. pp. 96–98. ISBN 978-1-137-48711-7. ^ Gibson, Bryan R. (2015). Sold Out? US Foreign Policy, Iraq, the Kurds, and the Cold War. Palgrave Macmillan. pp. 97–98. ISBN 978-1-137-48711-7. ^ Gibson, Bryan R. (2015). Sold Out? US Foreign Policy, Iraq, the Kurds, and the Cold War. Palgrave Macmillan. pp. 98–99. ISBN 978-1-137-48711-7. ^ Gibson, Bryan R. (2015). Sold Out? US Foreign Policy, Iraq, the Kurds, and the Cold War. Palgrave Macmillan. p. 99. ISBN 978-1-137-48711-7. ^ Gibson, Bryan R. (2015). Sold Out? US Foreign Policy, Iraq, the Kurds, and the Cold War. Palgrave Macmillan. pp. 36, 100. ISBN 978-1-137-48711-7. ^ Gibson, Bryan R. (2015). Sold Out? US Foreign Policy, Iraq, the Kurds, and the Cold War. Palgrave Macmillan. pp. 101–103, 111. ISBN 978-1-137-48711-7. ^ "Iraq ex-president dies in Jordan" Archived 2007-08-26 at the Wayback Machine, Middle East Online, August 24, 2007, at age 91. ^ Scott-Baumann, Michael (May 2007) . "The Causes of the Six-Day War of 1967". Conflict in the Middle East: Israel and the Arabs. Hodder 20th Century History (Second ed.). London, United Kingdom: Hodder Education. p. 25. ISBN 978-0-340-92934-6. ^ "Abdel-Rahman Aref, 91, Former Iraqi President, Is Dead". The New York Times. August 25, 2007. Retrieved March 29, 2010.